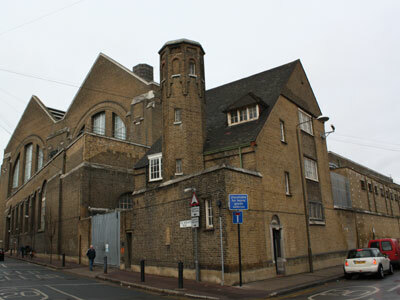 The old power station is still used as a back up for the London Underground system. Before the 60's it was powered by coal and water sludge. Mr Local said when he'd walk outside you would hear a fantastic crunching sound beneath your feet where the ash and soot had landed. Eight oil fuelled turbines fire up every now an then in the middle of the night, waking Mr Local with a high-pitched whistle. Some years back the Active Terrorism special branch of the Met Police uncovered evidence that the IRA had the old power station on their list of targets. This was about the time they replaced the old wooden gates with a steal monstrosity, razor wire and CCTV. Twenty or so bats live in the rafters of the old station. Some years back they had to by law put a vent at the top to allow them to exit in the night when the stations doors closed as bats are now endangered species in the UK. Mr Local often sees them circling in the night sky high above his back garden. 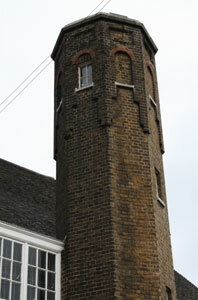 The tall, narrow tower beside the power station was apparently once used for cooling water. There are a series of small windows up high that circle the top of the tower. As the story goes the builder who originally built it in 1908 was so upset at not being paid on time he decided to rile his employers fixing the latch on all but one of the windows on the outside of the building - far too high for any one to reach. There's a lot to be learnt about our environment, global and local!